Yesterday, I went out for a walk wondering what my next blog post should be about. That is the really challenge here, coming up with new, original content daily and then I saw it, the house that made me cringe. The color isn’t so awful that neighbors would leave notes at your door demanding you find and paint your house something else, but a color so unremarkable, so lacking in possibility, that I coined the term, melt-in-your-mouth color. Normally, with regard to food, a melt-in-your-mouth sensation is a good thing. Like a chocolate cake that’s so rich and creamy, is dissolves on your tongue, yummmm. House paint, in my opinion, should be stronger, bolder with a longer lasting impression than one that disappears. 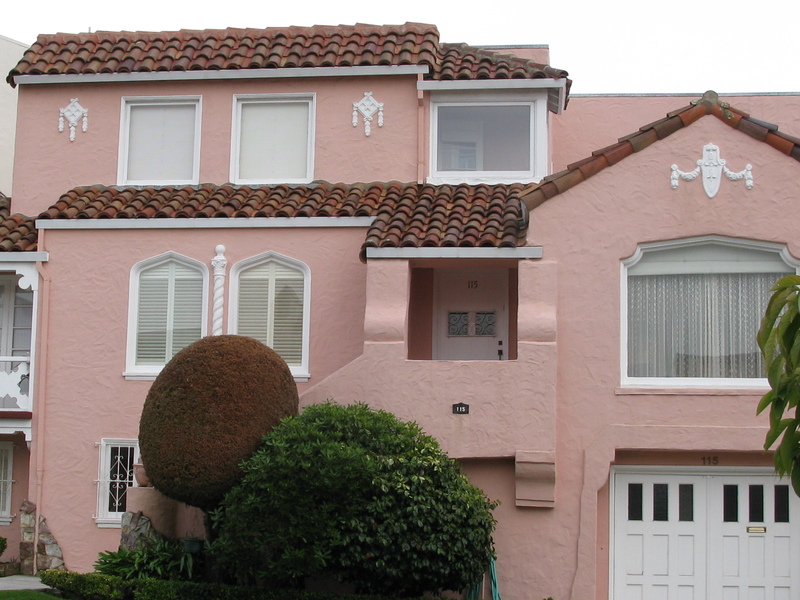 Pink is a particularly challenging color for a house. Personally, I don’t think any house should be painted pink unless it’s got stronger red or orange infusions to it. In this case, there are so many missed opportunities to really show off the architectural detailing that are currently lying dead in the road covered with a old baby blanket. 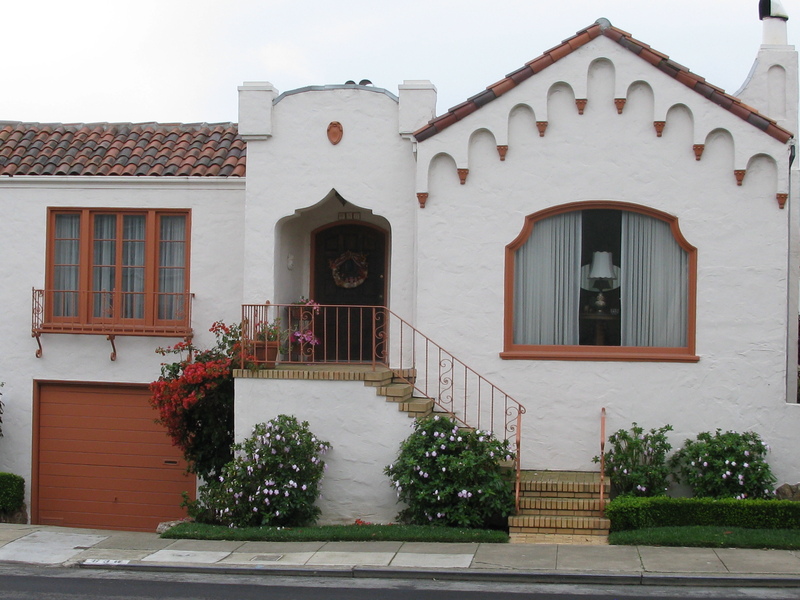 This is a relatively small house that is only two colors, which, as you already know, I think is a mistake, but what they have done is brought out a small but interesting detail in the architecture that rises the overall appearance of the house from mundane to noticeable. 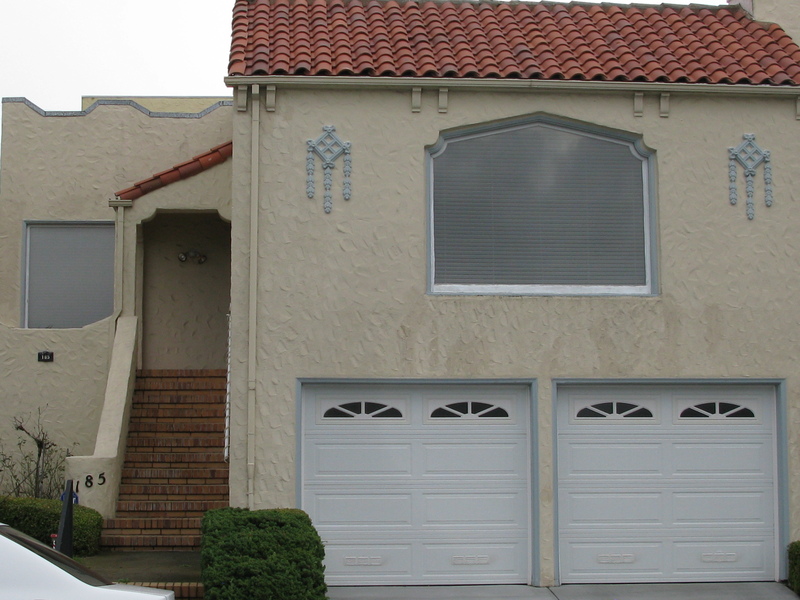 Imagine how less of an impact this house would have if those arch holders were also painted white. Personally, I would have liked to see more use of the brown with a strong black accent around the windows and the garage. Just another color to heighten the overall impression and expression of the home. This is another example of melt-in-your-mouth (miym?) color. Blue. Blue is a really tough color to make work. There’s nothing like a blue sky or a blue ocean or blue eyes but blue houses? That’s another call altogether, which is funny because my house is painted blue. I could not see it any other color because it is such a tall house, I wanted it to work with the sky, not that it does exactly, but I couldn’t really imagine it painted red. I think you can see where I going with this. 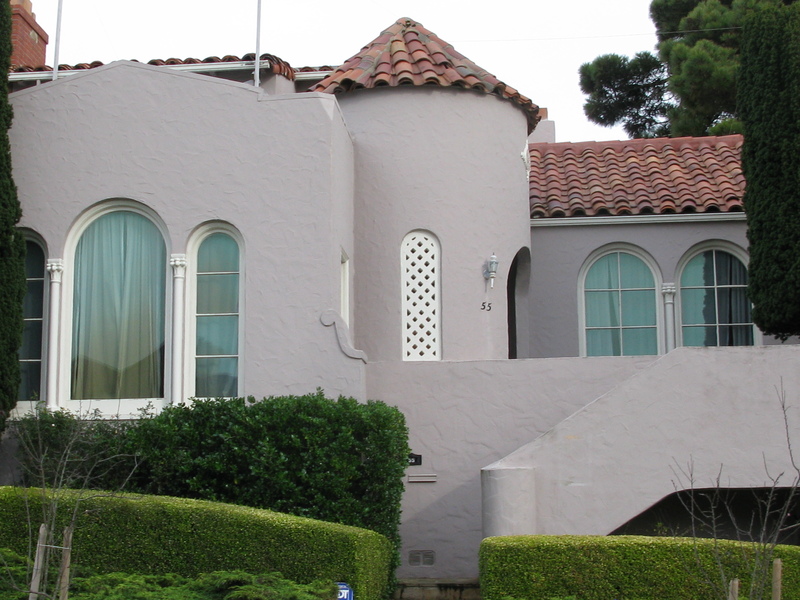 If you are going to paint your house, look at it closely and find whatever opportunities there may be for showing off an accent, playing with the architecture. Observe the shadows that move across the face of your house. 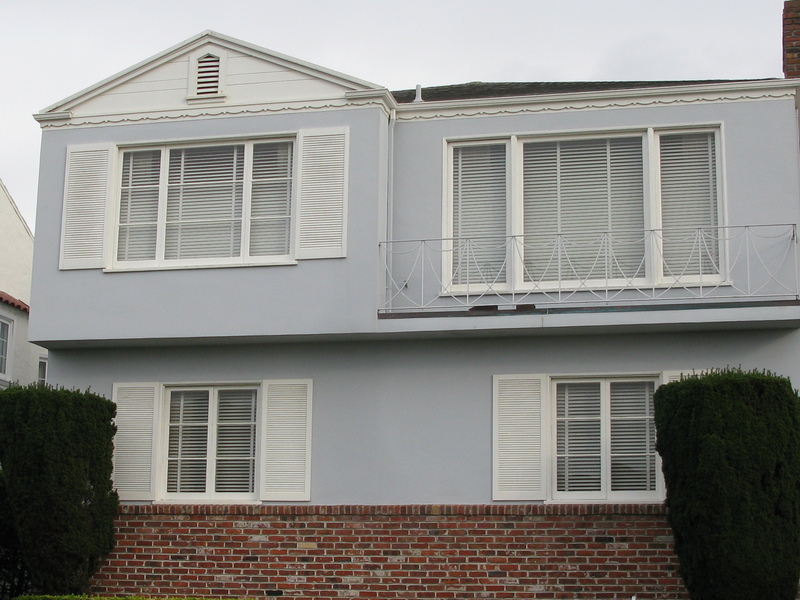 In the photo below, the house is painted one color but the shadows make it look much more interesting than it actually is because of the slight change it brings to the paint choice. Choosing the right color isn’t easy. You can hire someone else to do it but I recommend stepping up to the challenge. Look at nature, discover your own opinions of what you like and don’t like. Look around at the things inside your house, what’s there that you like, and what’s there that you don’t. And the things you don’t like, why are you keeping them? Look inside your closet. What colors are you naturally drawn to? What paintings do you like. Get to know yourself and then feel free to express your house the way you would express yourself to the world. Don’t be shy. 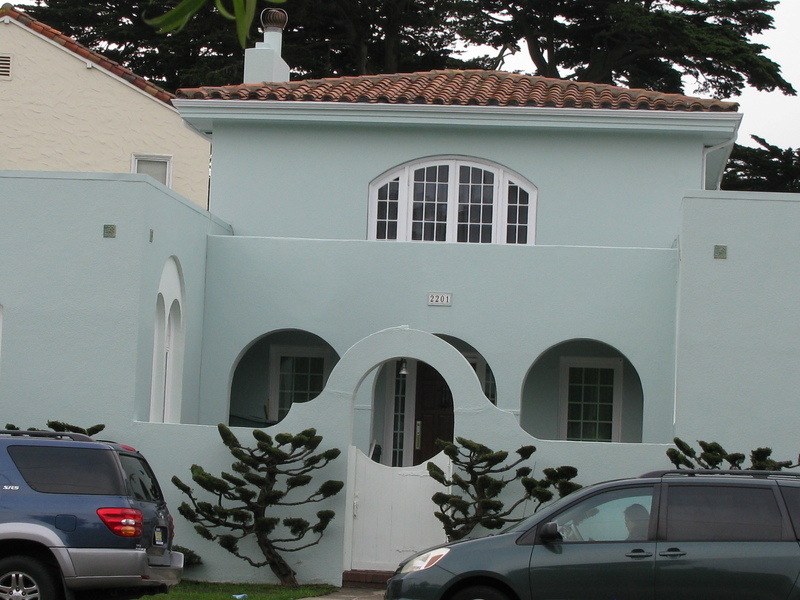 This entry was posted in Uncategorized and tagged arches., cringe, Design, detail, pastel, san francisco. Bookmark the permalink.